As marketers, capturing buyer attention is everything. Without it, we're just throwing more content, emails, ads, and offers into the abyss. Yet, there has never been a harder time to earn buyer attention. Thanks to advances in technology and the abundance of information on the internet, today's buyers have a lot more knowledge and power. They can learn about our companies and products through many channels -- online and offline. Meanwhile, technology has made it much easier for marketers to create more content, push ads, and send emails, -- and we're doing it more, more and more. The convergence of these two forces has resulted in diminishing returns for marketers. Our prospects are overwhelmed by the amount of content they're exposed to, and they are tuning us out. Consider that the average office worker receives 121 emails a day. With that staggering number in mind, it's not surprising that people are unsubscribing from emails at higher rates. Research shows that the number one reason users unsubscribe from email lists is because they get too many emails in general, not necessarily because they don't like the content. At Socedo, our nurture emails get a 1% CTR on average. A 2% CTR is now considered "good". At this point, simply turning up the volume doesn't work anymore. As marketers, we need make sure that our engagement is more targeted and valuable. Instead of pushing what we "think" customers want, we should wait for them to tell us what they care about. Instead of starting a campaign because a senior leader thinks it's a good idea, we can use customer data to inform the campaign strategy, content and execution. It's the kind of marketing that aims to listen, learn, and then engage. For example, an intent-based email would be sent to a prospect as soon as they show interest in a relevant topic, and the email would reference the prospect's interest and provide relevant content. But intent-based marketing is not just about serving the right ad or message to trigger a purchase. It's about responding to people's intentions in the right way, wherever they are in the buying journey. It is this level of personalization and relevant engagement that will make people choose your brand versus your competitors. 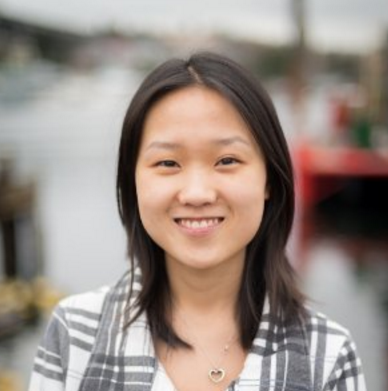 At this point, marketing automation platforms have enabled us to nurture leads, and personalize our emails, website content and ads based on the data we've collected. This is a great start, but it's not enough. If the only actions you're tracking are email clicks, webpage visits and other engagements with your company, you are only tracking leads that are "in-market", or actively in the buying process. In reality, the majority of the B2B buying cycle is over by the time a buyer lands on your website. According to Corporate Executive Board, prospects have made 60% of their buying decision before talking to a sales rep. 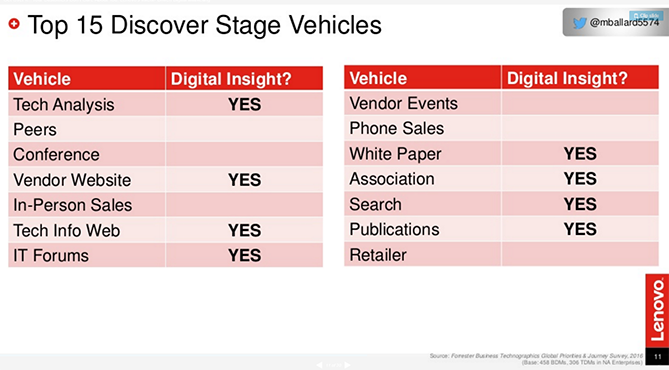 According to Forrester's Business Technographics Survey in 2016, buyers use 15 vehicles during the Discover stage. More than half of these vehicles are online, and thus represent sources of digital insight. On Twitter, we can identify potential buyers based on their tweets and following relations. On LinkedIn, we could find potential buyers by looking at people's group affiliations (i.e., specific product user groups), the influencers they are following, the articles they are sharing and commenting on. On Quora, we could do the same by looking at who is asking questions related to our product category. On Meetup.com, we could see people's profiles and their meetup attendance history. Finding the right keywords to use to target and trigger your marketing campaigns requires you to look at keyword research a little differently. You're not looking for the keywords leads are using to find your website, because that's only a small percent of their overall activity. This is another important set of social intent data that will tell you what topics your leads are researching -- even if they aren't actively performing the research directly on your site. Social intent data means you aren't limited to the keywords strictly associated with search research. Event hashtags, industry topics or other keywords could all indicate a good fit and need for your product or service -- especially from your more passive leads who aren't actively searching Google. 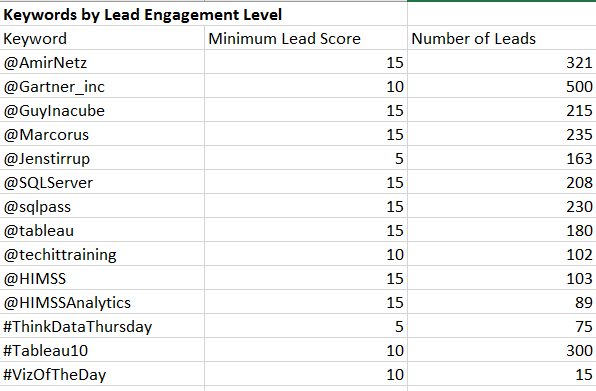 Unlike traditional lead scoring, where your leads' actions are limited by the amount of content you create and promote, tracking keywords and social actions in this way could give you hundreds or even thousands of results. You can track as many keywords as you want, but you don't want to create a campaign around every one. You want to prioritize the keywords where you see the most opportunity. On the other hand, if a keyword has been used by a lot of leads in your system, but that's the only thing these leads are doing and they don't have a high lead score, you should not spend time crafting content on that topic. Next, look at how many leads are using a specific keyword or social activity to know whether or not you should focus on it. We'll talk about measuring and improving this list in the last step, but this data will give you a good place to start. When you perform research on social keywords, you may learn things you expect, i.e., your audience is engaging with a social keyword you're already creating content around. You may also find a few surprising keyword opportunities that you weren't focusing on at all. The least surprising keywords are where you want to start. 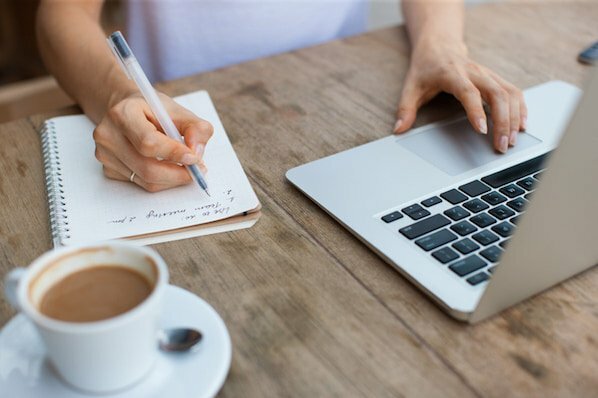 Before you begin creating campaigns, you need to determine what content you'll use to educate and nurture the leads taking these specific social actions. This process begins by auditing the content you already have. What's my specific message or call to action for people who are interested in this topic? Keywords you've actively targeted and rank for. These have always been your main SEO focus. You have good quality content on the topic and know the best way to target the audience. Keywords you create content for but haven't made a priority. Before this research, you may have known there were opportunities here but didn't realize how valuable they were. The content created probably needs revisions and you may need to create some new content to support it. Keywords you didn't know your audience cared about. These are the ones that really surprised you. You currently have no content to support these campaigns and need to develop the right messaging to approach this new audience. All these keywords still present strong opportunities. As you begin creating campaigns, you'll be able to test out the process on keywords you know you have strong messaging for while you build out your content and messaging for the rest. Start by focusing on two to three of your strongest keywords, and build campaigns around those. Based on your content audit in Step 3, you should be able to identify a few "low hanging fruit" keywords where you already have good content to share. Your early concern shouldn't be building out long sequences either. Create one to two follow-up emails per campaign and see how they perform.